T-Mobile is definitely out to show the world its slogan, “Life’s for Sharing,” really does ring true. Just like its previous (and very entertaining) event in London’s Liverpool Street Station, they manage, once again, to bring together the masses for one common experience. 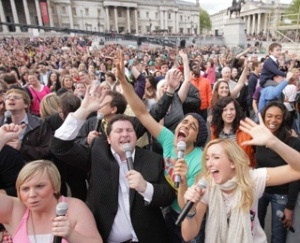 In London’s Trafalgar Square, thousands of strangers united in what has to be the largest sing-along in history. The Beatles’ “Hey Jude” played while the crowd sang into microphones and watched the enormous screen for lyrics and the live video that filmed the entire event. The YouTube video generated comments like, “If I feel fed up I just watch this or the dance one, it definitely cheers me up,” “Epic!” and “Amazing. So happy,” clearly verbalizing the optimistic feeling created by the event. Hopefully the next one makes its way to our side of the pond! ← People Are Beginning to Notice . . .